Last week I got my son's report card which covers how well he is meeting his IEP goals. There were some surprises like that he can pedal a bike 5 feet without help which he can't do at home. But his teacher and I are seeing the same things at home and at school which is great. I filed it away with the rest of his paperwork and while I was there I looked back over almost 4 years of goals. I love being able to look back on his amazing progress. One PT goal that was written for him when he was 9 months old was to be able to hold a toy. He had a feeding goal at 6 months old to be able to drink six ounces of formula without choking. When I see those goals I'm reminded of how far my son has progressed. Sometimes you just need a trash can to help you learn to walk. It's been a long journey and there are so many ups and downs. In the beginning it felt like 1 step forward 5 steps back. I spent so much time doing research and reading physical therapy text books so I could learn how to help my son. I turned into an obsessed crazy lady creating new ways for my son to improve his motor skills for a short time. I mellowed out eventually and learned how to do the special needs parenting to the best of my abilities. I've learned to enjoy the highs and handle the lows much better. There have been many successes on Mark's CP journey but these are some of my favorites. The Best Day of my Life - We were told that Mark may never walk when he was 9 months old. That diagnosis was a crushing blow and the uncertainty was the hardest part. Brett and I worked daily with Mark on his therapies hoping that one day he would walk. When that day finally came we experienced joy like we've never felt before. I would love to relive this day over and over again! Confidence; My Son's Best Weapon Against CP - Mark never had much confidence in his motor skills until recently. It's been great watching him learn to trust his body and know how to make corrections. What I Would Tell Myself the Day Mark was Diagnosed with CP - I think we all wish we could go back in time and tell our younger self something. I don't know that I would have listened to future me, but I sure would like to have the chance. 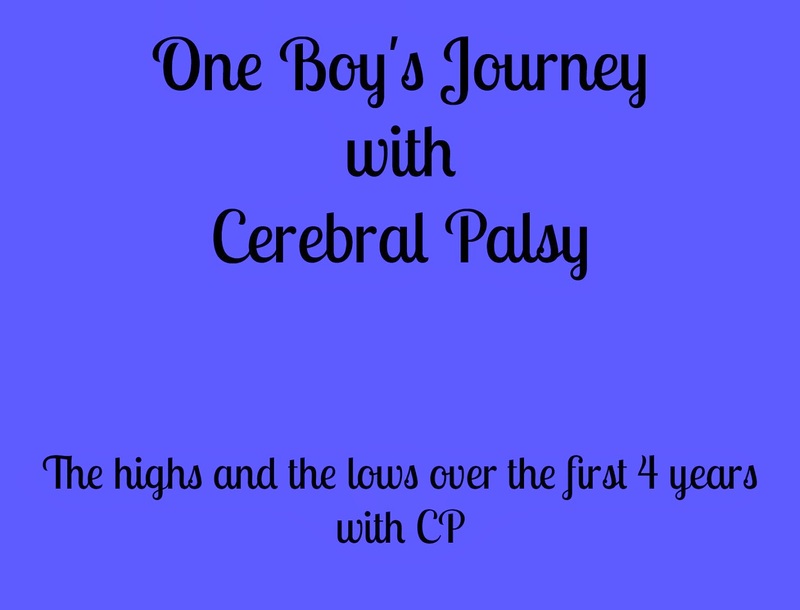 While there are so highs on my journey with CP, there have been many lows as well. I think most parents can relate to the simple truth that there were many days when I found myself in tears wanting to quit. Of course that isn't an option so somehow you move on to the next day and try again. CP and Puppy Confessions - Fighting to get services for your kids is so stressful! You just have to keep fighting, you're the only one who 100% has your child's best interests at heart. I relied heavily on my fellow CP mom blogging friends during this time. When Your Son Rides the Short Bus - The pain of putting my 3 year old on a bus stays with me a year later. Life has a great way of shoving a spotlight on your flaws, even if they're from years ago. Where do Your Kids go to Preschool? It's complicated - I just hate explaining why my son is I preschool through the school district. I'm not embarrassed just annoyed that strangers ask me things that are none of their business. Mark has come a long way and we continue to work everyday. I am blown away b his progress and I look forward to watching him continue to progress. Awesome awesome job! I won't even pretend to know what you go though. You are a wonderful strong mama and so happy he has made so much progress. Thank you. One of the benefits to blogging is having a record of his progress. I understand a lot of what you are going through. I had a son I took care of for 18 years. He was in a drowning accident when he was 13 months old not with me at the time. He was revived and changed into severe spastic quadraplegia cerebral palsy! I could go on. He was medically fragile. I learned you should take care of yourself and do the best you can. They are always smarter and can do more than you think too!! I am proud of you! !